Parfums DelRae launched Début, their fourth fragrance, in 2004. Like the others in the line, it was created by perfumer Michel Roudnitska. The notes are bergamot, lime, ylang ylang, fresh leaves, lily of the valley, linden blossom, cyclamen, vetiver, sandalwood and musk. Such, of course, might be the motto of any niche perfume line, but the DelRae line, more than most, lives out the sentiment: the fragrances are both unusual and beautifully done, and although they are expensive, one does not, as in some cases, feel that one is paying merely for the privilege of buying something exclusive. Début is my favorite from this line. It has been aptly described as "an entirely modern take on a fragrance that pays homage to Diorissimo" (International Herald Tribune; 2/10/2004). Messing around with Diorissimo might seem a dangerous undertaking, but Michel Roudnitska's creation is a wonder in its own right, and manages to be a fitting tribute while maintaining its own distinct personality. It starts with a sharp little burst of citrus and green notes sweetened by ylang ylang. The linden joins in shortly thereafter, with a lingering hint of lime, and eventually the lily of the valley appears and the sweetness (and sharpness) of the top notes begins to calm. After a time, it settles into an indistinct soft floral over a pretty woody musk base. It is a soft, feminine fragrance, clean without being soapy, and fresh without evoking cleaning products. To my nose, it is a bit duskier and less bright than Diorissimo, but at the same time, it nicely captures Diorissimo's young but sophisticated character. It is more sheer than heavy — certainly more sheer than the other fragrances in the DelRae line — but despite its delicate nature I don't find it wispy or insubstantial, and the lasting power is extraordinary for an Eau de Toilette. I can still smell it 8 hours after application. Début is an Eau de Toilette, and runs $80 for 50 ml. 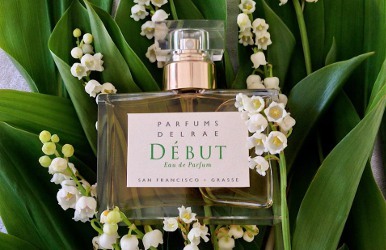 For buying information, see the listing for Parfums DelRae under Perfume Houses. Update 10/1/2006: the Eau de Toilette has been discontinued and replaced with an Eau de Parfum. Update 11/15/2006: the new Eau de Parfum is a deeper, richer, but still true-to-the-scent version of the original Eau de Toilette. The floral notes in the heart stay around much longer before it fades into the musky woods of the dry down. I found the overall lasting power to be about the same, but then, the Eau de Toilette already lasted all day on me. The Eau de Parfum is priced at $125 for 50 ml. I've had a sample of this forever kicking about in my drawer and I've been meaning to try it. Will do tonight. Thanks for giving me the inspiration. T, do try it, although unlike the other Delraes, which I think do better dabbed than sprayed, this one really needs a good spray to make an impression. Many people have told me they find it fleeting — I swear I can smell even 1 spray at the end of the day. I also love Debut, and I agree that it is anything but wispy and light. I also noticed a pronounced indolic note and the musks are anything but clean and pale. Very interesting composition. I need to try this again. It sounds like I would love it. You know, to me it really does smell like fresh leaves. That and the smell of fresh buds in early spring. Yes, it is very spring-like, as is Diorissimo. L, it does sound like you — did you not like it the first time? Wow, that is an impressive range of tastes from Voleur de Roses to Debut, M! I'm sure that when I had just acquired my perfume addiction, my likes were much more narrowly defined. Ah! For once I am right. I always thought that you would like Debut. It is so true what you said about living out the sentiment. I think their scents are exqusite and quality just shines through. Oh good lord, do I ever need to get my samples organized. I know this is around here *somewhere* You say the words linden and lily of the valley, and I immdietly know I must try it Thanks Robin! K, I think you would like this one too. It was a bit heady, I thought. I can see that, at least for the first few minutes. But it really isn't at all heady once the initial sweetness calms. R, I missed this post yesterday, but I found my sample and tried it today. I couldn't agree with you more on this one – it is lovely and feminine without being wispy. I imagine it's one that Grace Kelley might have worn. I love the name, too. Seems perfectly fitting for a coming-out ball. Thanks for this review, Robin. I sampled Amoureuse last week (very pretty), and while I was poking around looking for the notes, I read about Debut and thought it might be the one I try next from that line…now it's definite! Oh yes, Grace Kelly & Debut is a perfect match! Amoureuse is gorgeous, but so strong that I find it hard to wear unless I just put on a tiny dab. Debut is much less of a “big perfume”. Great. I've seen that sample every night for about four months, and I finally want to try it and can't find it. I blame the cat. Unfortunately I don't have a cat to blame for my lost samples…hope it will turn up! Didn't we both discover this one at about the same time? I think we were the first ones on MUA to buy it and write reviews. Frankly, the only one of the line I do not like is Eau Illuminee, but the other three are all five stars in my book. I can't wait for another one! What will DelRae do next? I think that is right, R! And it is one of the few bottles I bought that year that I've just about emptied. Eau Illuminee is probably my least favorite too. And — hope she will do something, it has been a long wait.